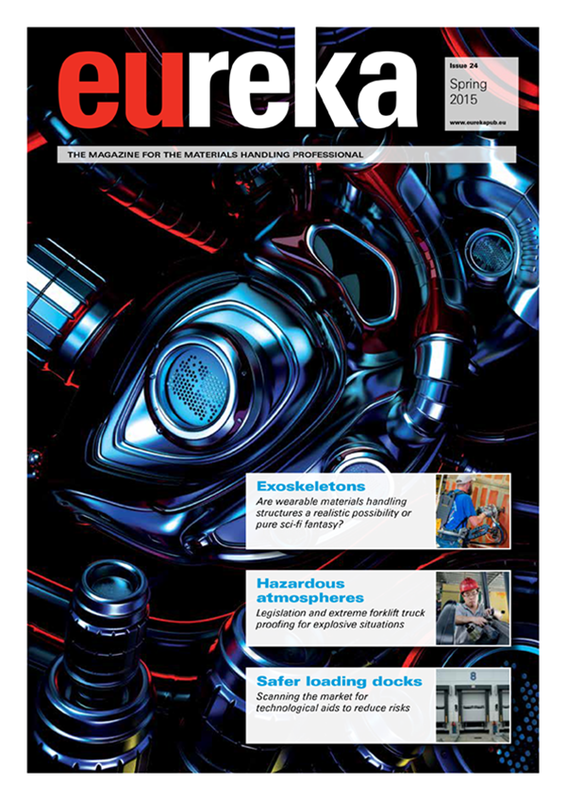 Home / Technology / Exoskeletons: the future for materials handling equipment? Exoskeletons – wearable structures that give the human body greater abilities – appear to be developing fast. So could such technology be the next great step forward in terms of materials handling? It sounds like the stuff of science fiction – a wearable outer frame that increases your strength, range of movement and stamina, while allowing you to move much as normal. And such technology has certainly featured heavily in the world of sci-fi films in recent years, from the ‘power loader’ worn by Sigourney Weaver’s character Ripley in Aliens to the robot-like, full body suit protecting Robert Downey Jr in the Iron Man series. But such technology is far from just a sci-fi fantasy. A number of exoskeleton devices have already been developed, mostly consisting of a battery-powered metallic or composite frame controlled by electronics which ‘read’ the movements a person is trying to carry out and then control the frame to provide mechanical assistance. Up to now, the major target markets for such technology have been military and medical. 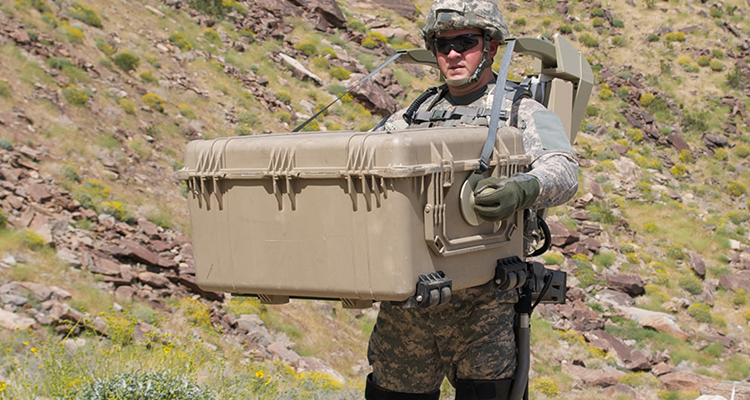 In the military, the technology could help troops carry greater loads for longer and reduce their levels of fatigue; in medical terms, meanwhile, such devices are already being used to help injured or disabled people learn to move again. It’s an exciting area and one which has the potential to filter down into everyday use in time. 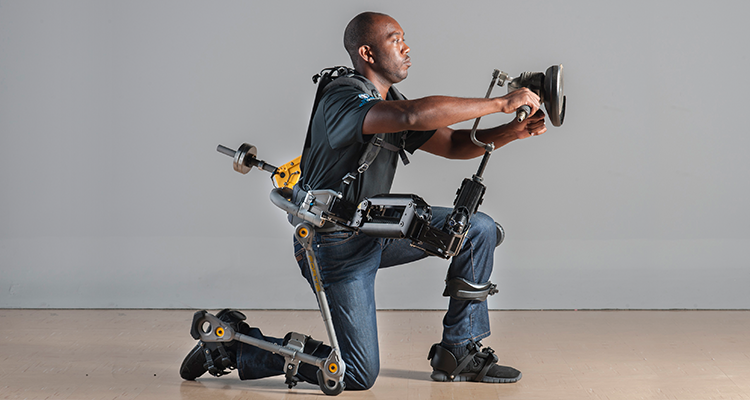 So are exoskeletons likely to become the handling equipment of choice in industrial applications in the near future? One area where such technology could certainly provide a major boost is in manual handling of relatively small loads – an activity that has been the cause of many minor and not-so-minor injuries over the years and where reducing or even eliminating the physical effort required would clearly be a great step forward, helping to keep workers injury-free and potentially making them more productive. Already, lightweight exoskeletons of exactly this kind exist, most notably Lockheed Martin’s recently unveiled FORTIS – an unpowered exoskeleton designed to take the weight of a load like a heavy hand tool off operators while they work. The firm suggests its technology, which has recently won a number of design awards and is currently under test with the US Navy, can result in productivity increases of two to 27 times. What’s not so clear at this stage is whether exoskeletons could ever take over the job of moving heavier loads, like a one-tonne pallet. Most of the systems in development today offer relatively restricted lift capacity and since most have been designed to be lightweight and portable, it’s debatable how soon and how far their lift capacity can realistically be increased. 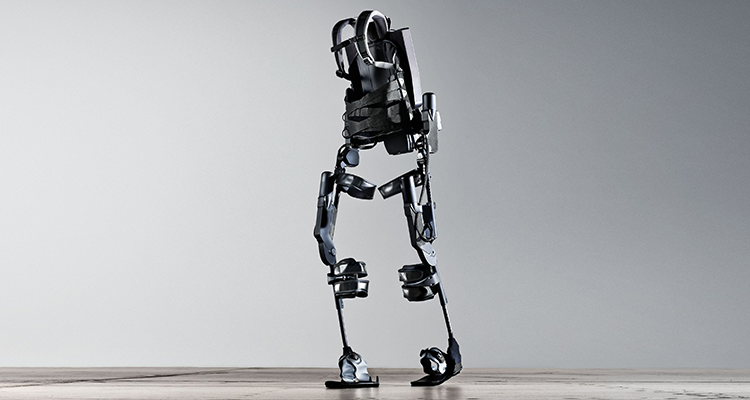 US firm Ekso Bionics, whose technology is used by Lockheed Martin’s FORTIS and whose own Ekso GT battery-powered exoskeleton, which is designed to help people walk again, has been commercially available for three years, suggests the lift capacity of such systems will soon rise, however – though it doesn’t say how far. "Currently, we support the weight of a human being up to 220 pounds in our medical device by transferring the weight to the ground. Applying the same principles, one can envision moving a significant amount of load in the near future"
The firm also believes its technology is suited to a range of non-medical applications including industrial ones, she confirmed. Current technology, she said, was “only the beginning of a myriad of possible uses that require both strength and skill”. Much will depend on the practicality of any power source such exoskeletons use, of course, but here again, the future is promising, suggested Darling. “We are on the brink of substantial reduction in battery size for a high amount of power provided, as well as in the midst of development of other functional power sources such as solar or hydrogen cells,” she pointed out. End of the lift truck? Even if exoskeletons do eventually offer more load capacity and sufficient power to suit industrial shift patterns, the big question for logistics managers is whether they will offer any benefits beyond those already incorporated in today’s handling equipment. This is a key issue because while today’s ride-on lift trucks obviously depend on wheels, rather than mechanical legs, they are otherwise quite similar to exoskeletons, being designed to fit snugly and comfortably around an operator while substantially increasing their strength and range of movement. Allowing a single human operator to lift loads from 1 to 16 tonnes – some of these to heights of up to 11 metres – today’s lift trucks offer amazing performance that far exceeds the capabilities of even the most ambitious exoskeleton concept to date. "Today's lift trucks offer amazing performance that far exceeds the capabilities of even the most ambitious exoskeleton concept to date"
Designed around the human operator, they also offer levels of comfort and control that are hard to rival, with ergonomically designed interiors and controls that keep operators comfortable and allow them to work for periods of several hours at a time. Like many exoskeletons, today’s lift trucks also feature sophisticated management electronics and with a range of proven power sources, the versatility of numerous bolt-on handling attachments and the ability to work in some of the harshest possible environments – including dirty, dusty, wet, cold or hot ones – it is little wonder these trusty workhorses have been at the centre of industrial handling operations for decades. While exoskeletons undoubtedly have an exciting role to play in the future, they are – for now at least – nowhere near equalling the performance, availability or affordability of what we have right now in the modern forklift truck. Where the new technology does seem a more realistic proposition is in manual handling operations – imagine the productivity boost exoskeletons could provide in carton stacking or vehicle loading applications, for instance – but even here, it remains to be seen whether the benefits they offer can be made financially attractive to business users, practical from a power supply and maintenance point of view, or even acceptable to the workforce required to wear them (remember the fuss about workers becoming ‘robots’ when wearable, wrist-mounted order picking terminals first came in?). For now, therefore, it seems likely the pivotal role of the lift truck in modern logistics operations will not change for many years and that exoskeletons will be used only where their exceptional ability – that of automatically accompanying the user wherever they may go – is truly called for. Apart from Lockheed Martin’s FORTIS and Ekso Bionics’s Ekso GT, several other exoskeletons of note have been developed in recent years. They include the HULC (Human Universal Load Carrier) which was first unveiled by Ekso Bionics in 2008 and licensed to Lockheed Martin the following year for military development. Lockheed Martin went on to produce a ruggedised prototype full body exoskeleton designed to help soldiers carry more and move more efficiently, said to be resistant to sand, wind and rain, as well as extreme temperature and humidity – useful attributes in both theatres of war and many harsh industrial environments. Japanese developers, too, have been busy with this technology. Cyberdyne’s HAL (Hybrid Assistive Limb), for instance, is another robotic suit designed for therapeutic and fitness purposes which is just going through an approval process for use as a medical device in the US; while another Japanese firm, ActiveLink, has developed the closest thing yet to Ripley’s power loading arms in Aliens with the aptly named Dual Arm Power Amplification Robot, which measures the magnitude and direction of the force applied by the operator and allows them to ‘feel’ through the arms via Direct Force Feedback. Even students have been getting involved in this arena, with a group at the University of Pennsylvania recently developing the Titan Arm, a backpack-based powered upper body device for rehabilitative applications and occupations requiring augmented strength. The team behind the device, which says it can easily support 25 kg loads, has been nominated in the 2015 Edison Awards, which seek to recognise new product innovation.